The default values listed below are the ones coded in the pterm application; they might be overridden by a configuration file. Pass all Alt key combinations to the device. Add font to the font list. Cursor always blinks (default: cursor blinks only when window has focus). Disable the Terminal Properties dialog. Attach to the given file descriptor instead of using a pty. Open given device instead of using a pty. Don't modify environment variables (default: unset LINES and COLUMNS; set TERM according to the protocol). Use the n-th font from list (starting from 0). Use font as the current font. Pass signals to the program. Set the initial size to R rows, C columns. Save up to N lines in the scroll-back buffer. Specify the foreground and background colors. The colors argument is one or two numbers in the range 0 to 7; the first is for the foreground and the second for the background. The numbers are indexes into the first 8 entries in the palette for pterm (see the “Files” section, below). Enable the Ctrl+Alt+f key chord which allows you to toggle between full screen and window mode. Don't create a new session. (“el”) Start the shell as a login shell. Set maximum size to R rows, C columns. Set minimum size to R rows, C columns. Output device name to this fd. Don't read the configuration file. Increase program's priority (default: don't change any priority). Use QNX protocol (default: ANSI). Use prefix for the pty (default: /dev). Set window title to string. Don't realize the pterm window until it receives output. This option takes precedent over -z and -Z.
Unset given options (AaBbQv) even if set in the configuration file. Visual bell (default: use audio beep only). Exit with shell's exit status (default: always exit with zero). Wait until closed unless exit status is zero (default: close window as soon as the command terminates). Name of the program that pterm starts. A shell is started if neither program nor any of the following options are specified: -D fd, -d path, or -N fd. The pterm application is a terminal emulator that opens a window on the Photon workspace and attaches itself to a character device. The device is usually a pty (pseudo-tty) on the local node, but you can use the -R option to override the node (e.g. if the pty driver isn't running on the local node). Or you can use the -D or -d options to specify a device (e.g. a serial link connected to a modem). By default, pterm starts a shell on the “slave” side of the pty. The shell won't be spawned if a -D or -d option is used to override the device or if a -N option is used, in which case it outputs the device name to the given file descriptor. In all cases, you can use a command-line argument to force a program to be started on the device. If the -d option specifies a pty, then the program is started on the specified device and the other side of the pty remains unused (which is probably not the desired behavior). You can use the -E option to pass the original environment to the command. By default, pterm closes its window as soon as the program spawned in it terminates. The -Z or -z option overrides this default — the window remains open until the user closes it. This option can be useful when a program is spawned that outputs a message and then exits immediately. The -G and -X options can also be useful for a program or script that calls pterm. If -G is used, then whenever pterm catches a signal other than SIGTERM, SIGCHLD, SIGILL, SIGWINCH or SIGSEGV, the signal is passed to the spawned command. This means that a script can spawn pterm and easily kill its command with a chosen signal. The -X option causes pterm to exit with the same exit status that the command returned (or even to kill itself with the signal that killed the command). Sends the SIGHUP signal to the command. If the command survives, sends the SIGTERM signal. If the -X option was specified and the command survives both signals, pterm terminates with exit code 1. If a process running on the pterm's device is producing output very quickly, you can increase the total throughput by running the “consumer” at a priority lower than the “producer.” Data then arrives at the pterm in larger portions. You can further increase the throughput by using larger buffers in the pty driver — pterm uses a 4K buffer, while the pty driver's default is 512 bytes. You can use the -P or -p option either to reduce pterm's priority or increase the spawned command's priority. Of course, changing the priority has other side effects: if pterm's priority is reduced below the default (-p option), then other processes running at the default priority may significantly reduce the speed of pterm and, as a result, the total throughput. On the other hand, if the process in pterm is running at an increased priority (-P option), then it may affect the performance of other processes, especially when it doesn't produce much output. You can use the -g option to set an initial terminal size, and the -m and -M options to enforce minimum and maximum sizes. These sizes apply to the terminal, and not the pterm window. If the window is re-sized to be smaller than the minimum size, the terminal is clipped. If the window is re-sized to be larger than the maximum size, the terminal is centered. If there is a conflict between the -g option and either -m or -M, all options are adjusted to reflect the last option specified on the command-line. The Ctrl-Alt-[ and Ctrl-Alt-] keychords change the font to the previous/next on the list, without changing the terminal size (rows and columns). Ctrl-Alt-< and Ctrl-Alt-> change the font without changing the window dimensions (measured in pixels). If, however, the new terminal size would be smaller than the minimal size, then the window must be grown. If the new size would be larger than the maximum size, the window won't be made smaller — instead, the terminal's margins are adjusted to fill the window. Here you can change the title or restore the default title. If you don't remember the escape sequences you can use in the title, press the button marked ? to see the list. Here you can set the current terminal's size, as well as the minimum and maximum size (measured in pixels). You can choose from one of the predetermined font styles and sizes, or you can select the custom font list. 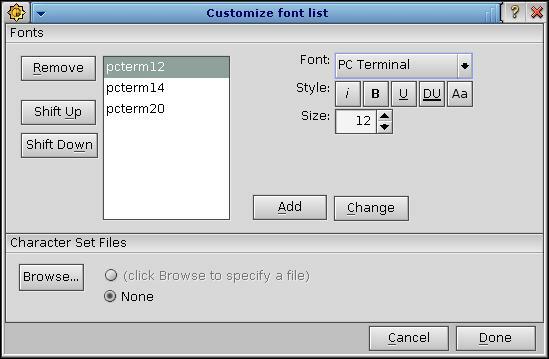 You edit the custom font list by clicking Customize... For more information see the section, Customizing your font list. Whether the “general” or “command-specific” configuration file is saved when you click the Save & Close button. To display a scrollbar on the pterm window. The number of lines in the scroll-back buffer (equivalent to the -H option). All the fonts displayed in this dialog must have the same character encoding. By default, pterm assumes it's the PC character set (“IBM code page 437”). If your fonts use a different character encoding, you'll have to specify a charsets file (click “Browse...”) that defines that encoding. See ptermcs for information on creating charset files. where $0 is the name used for invoking pterm — usually it's pterm; if $PHOTON_PATH is unset or empty, /usr/photon is used instead. If the -C option is given, the option's argument is used. Otherwise, if $PTERMRC is non-empty, its value is used. Otherwise, if $HOME/.ph/pterm/$0. $CMD.rc exists, it's used (where $CMD is the command-specific file started in pterm). You can use the -n option to suppress the loading of the current settings from the configuration files. 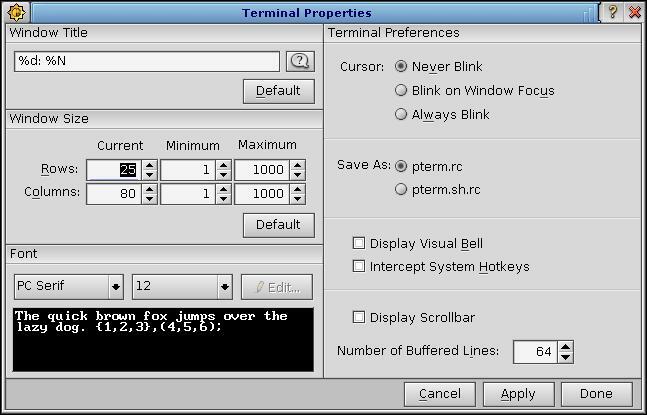 The -c option disables the Terminal Properties dialog. You can use the -u option to restore the default behavior of the following options: AaBbQv. This option overrides the setup in the configuration file. Use Alt key combinations for window manager commands. Suppress loading of font table from configuration file. Clear always-blink option for cursor. Clear never-blink option for cursor. Turn off the visual bell. If the PTERMPAL environment variable is defined, its value is assumed to be the path to a palette file. Otherwise, pterm looks for $HOME/.ph/pterm/pterm.pal or $PHOTON_PATH/pterm.pal. The palette file can be either a binary file containing sixteen 32-bit entries or a text file containing sixteen 8-digit hexadecimal numbers separated by newlines (and terminated with a single newline). If the length of the file is neither 64 nor 144 bytes, the file is assumed invalid. The name of the root directory containing Photon files. The path to the palette file. The name of a local configuration file.